SPRINGFIELD – Missouri Ministry Wives are invited to join us for dinner and fellowship in conjunction with the MBC Annual Meeting. 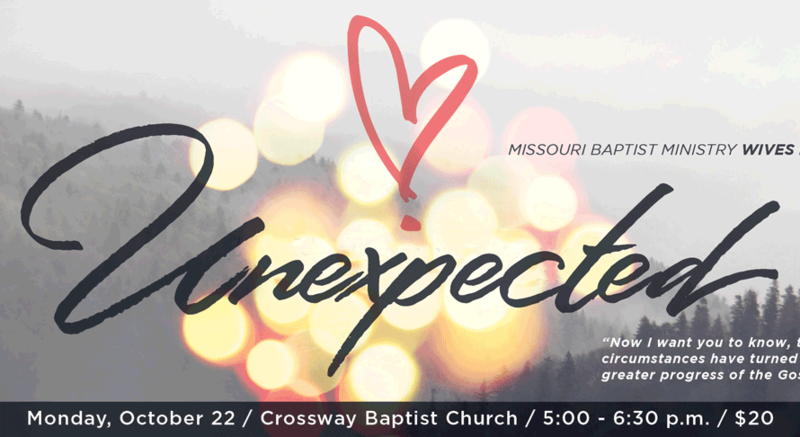 This year’s theme “Unexpected” will focus on God’s detailed plan to advance the Gospel through both our planned and unplanned circumstances. The keynote speaker, Lisa Finch (IMB, Sub-Sahara Africa), will encourage you with her insights into God’s “Unexpected” assignments of trauma and loss. Register early as seating is limited. Childcare is available through MBC Disaster Relief during the dinner. Sign up for childcare at https://mobaptist.org/annual-meeting/child-care/. For additional information, contact Carla Martin, MBC Event Coordinator, by email: cmartin@mobaptist.org or phone: 573.636.0400 ext. 361.